23 Aug Bikes, Antonio, Espana! 21 Jul Day 16: The wind beneath our wings. Toronto Sailing. 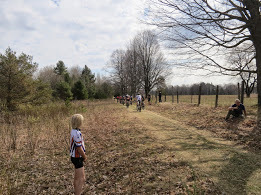 At the start of my second mountain bike race, I was feeling a different kind of nervous compared to the first race: the first race was fear of the unknown, fear of falling off my bike and never finishing, and fear of competing for the first time. After riding for more than 15 years, my ability wasn't something I had to prove to anyone. Now, here I was putting it out to be measured against others. And, after coming in second in my first race two weeks ago, there was the added pressure to perform. I realize it's not the Olympics or anything, but it still means something to me. 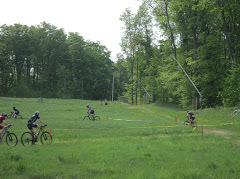 The fear this time around was riding a technically scarier course; on the last race I could get away with a fast and smooth race, but Kelso Ski hill had some sections that made my heart sink--like the pile of rocks that drops at the end. From above it's hard to see the step below and what you can't see is petrifying. Trust. On a pre-ride a few days earlier, I already had a few spills: after hitting some loose gravel on a sharp fire road turn my handlebars turned 180 and spit me off the bike. 25 May Race two: deflated tire but not spirit. Groan. 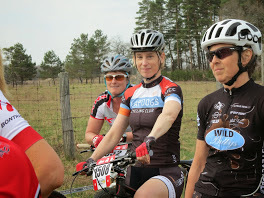 "You looked shell shocked at the start line," says my bike buddy. Yes, waiting with one leg on the pedal, arms on bars, and poised to push off, all I could think: "what am I doing here?" And while the women around me in my 40-something age category tried to reassure me they felt the same way, I was stunned. We're on a wide dirt road. Waiting. Waiting. Ten second countdown. Heart is pounding outside my chest. Nine. Wow, that woman's legs look strong. Eight. Apparently, other people think you can do this. Seven. I'm 42. Six. Can I puke now? Five. Four. Three. Two. Off we go. I'm last.